is NOT something my kiddos have trouble with. They do, however, have some trouble writing about their opinions and supporting them with reasons. So, when the time came in my self-created writing timeline, I thought about the best way to introduce this genre was through some short writing prompts. 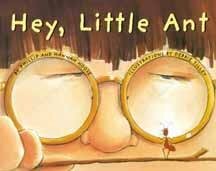 To get them talking, I read Hey, Little Ant. Such a cute book! I liked how it left the ending open. It helped us to have some discussions about what they would do if they were the boy and they had the choice to squish the ant. Poor ant… some of my goobers were all about making him sidewalk smear. After we read the book, I had the fill in this graphic organizer. Then, they pair/shared with a buddy. The next day, we continued our discussion about opinion writing. I introduced this graphic organizer. I reviewed the “ingredients” for an opinion piece and then I created an anchor chart to model for them how I would write my own. I chose a hot topic in my classroom. We were working on this right around the time the White Sox and the Cubs were having their home openers. 🙂 Go Sox! The next step was for them to try to write their own piece. At first, I thought I wanted to have the kids choose a topic at random. I had made copies of the form below, and cut each out. I was going to have them choose one from a pile and then write. At the last minute, I changed my mind. Instead, I projected the whole paper and let them choose what they wanted to write about. I’m glad I did this because then NO ONE complained about their topic. I saved myself a headache that day. They loved the one about grounding their parents, ha! While they were editing/revising, I found some scrapbook paper that I had hidden in my cabinet. Of course, I had to use it with this project. It is inspired by Amy’s Writing Tips and Tricks Craftivity. Love it! This was a quick prompt/project that I completed before Spring Break. I still am not 100% sure how long they need to be, so I just stuck with paragraph length. The think with the Common Core State Standards is that they can be interpreted more than one way. If you think this might be an idea you want to try with your class, click the picture below and you can download a free copy of my Hey, Little Ant graphic organizer, my opinion graphic organizer, and my prompt ideas. Hopefully, you’ll find it helpful. I’d love to hear what you think! Well, I’m going to get ready for tomorrow-Friday-… the best day of the week (in my opinion)! Hope you have a great night and weekend! I love this book! Always interesting to find out which students would squish or save the ant and why! Love your organizers, too…can use the last one for lots of writing! Thanks for sharing! I think I would have loved a teacher like you when I was that age. You have to be one heck of a Great teacher! You really seem to LOVE what you do ! I wish all teachers were in Love w/their careers! Wishing you the best for many many more young lives to enjoy /learn ! Thank you SO much! I just took over a year 4 (8-9 years) class in the UK and our topic in Literacy right now is Issues and Dilemmas… this is the PERFECT dilemma! We read the story Tuesday and used all three of your pages over the last three days and it was wonderful. We first sorted the squish or save ideas (we’ve been doing mainly pros and cons, so this was a bit different for weighing options which was great!) Tuesday. Yesterday, I blew up the ‘my opinion’ graphic organizer and we decided the fate of the little ant as a shared writing activity. Today we went through the prompts and chose one to write about. The kids loved it and came up with some really great ideas. Hi Becky, love this idea! I noticed the kids had binders with lots of sections in them. Just wondering how you organized this binder. Is it just for writing? Thanks! I love your blog! Could you tell me what font you used for the debate topics? I am looking for a simple font just like that one. I would really like to use your graphic organizer for a lesson I am teaching on Monday about opinions using the Hey, Little Ant graphic organizer. Would you be willing to send it to me via email? It is for a demo lesson for a teaching position that I really want. Thank you so much! I love the Little Ant lesson, but couldn’t find it on TPT. Please send me a link? I do a writing activity like this in my classroom, but I love your templates and the ideas for opinion topics. I also LOVE the way you displayed the kids final pieces. The pencil background is ADORABLE! would love to use your hey little ant resources. Could not find in your TPT store. Please help. Love your opinion piece on Hey ANt can you send me the link to purchase it on tpt. I love your “In My Opinion” graphic organizer. Is it possible if you can email it to me please? That would be amazing! Thank you! I loved your Hey Little Ant graphic organizer with reasons to squish or save the ant. I wasn’t able to find it in your store. Could you please send me the link….Thanks so much. I couldn’t find your Opinion Writing resources in your TPT store. Can you kindly email me a link so I can access/buy them? Thanks! I really like this as an opinion writing unit. I love the graphic organizers, anchor charts, and even the page with the writing prompts. I would be glad to purchase these on TeachersPayTeachers but could not find it. Is it out there or would you share? I really like the graphic organizer “In My Opinion”. Are you sharing this? If yes, I would love to use this with a couple of my older special ed. students. Can you please share your graphic organizers for this book with me?